Enga Governor Sir Peter Ipatas has called on his people not to be misled by criticisms of the O’Neill Government and its ability to deliver important infrastructure projects of national importance. 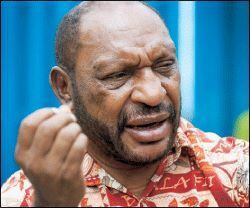 Sir Peter said the people should be wary of other Engan leaders that held senior Ministerial portfolios in past governments but had nothing to show for. He said the people should humble themselves and respect the Government for what it was doing and cooperate for services to be delivered. He said if other Engan leaders preached otherwise and promised miracles when they get to Government, the people should not be fooled. "I must tell the people of Enga to ignore such crazy Enga leaders who talk about making miracles when they form Government. They are dreaming and will dream forever after failing to deliver anything when they had the opportunity with past governments," he said. Sir Peter said major infrastructure projects in transportation, aviation, air terminals and ports, roads and bridges were being delivered under the O’Neill government.